Shortly after midnight Monday, Chris Moran crawled out of bed to accompany his brother in dealing with a raucous party around the corner from the south Sacramento home they shared. Within the hour, Moran found himself frantically using blankets and duct tape to try to stop the blood from escaping from the three holes in his brother’s chest. Tuesday, the Sacramento police arrested his neighbour Mario Junior Garcia, 19, for fatally shooting Talanoa Feinga, 27. 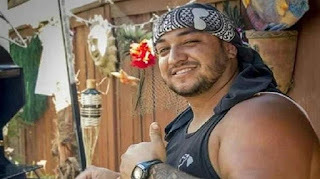 Moran said he watched as Feinga was shot three times in the chest outside of their Valley Hi home on the 8300 block of Anton Way. “They took such a beautiful person away from us,” said Moran, Feinga’s half-brother. Feinga worked with Moran at Feinga’s father’s contracting and roofing business. He was a father of two school-aged kids and recently started his own handyman business.